With terror spreading across the globe, you and your fellow investigators will venture to the far corners of the world. From the snowcapped peaks of the Himalayas to the bustling streets of San Francisco, you and your group of investigators will travel to the world’s major cities, its most remote wildernesses, and everywhere in-between to prevent an impending global catastrophe… the awakening of an Ancient One whose arrival will cast the world into eternal darkness. With tensions running high, and the fate of the world in your hands in these last, desperate days, the choices your group makes could have devastating consequences. 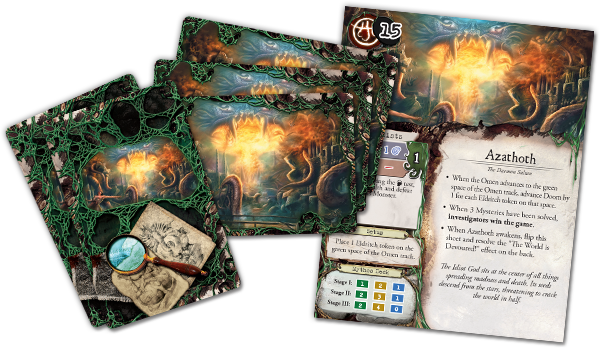 Even the components of Eldritch Horror add to the story and are designed to further immerse you in this epic, world-spanning adventure. 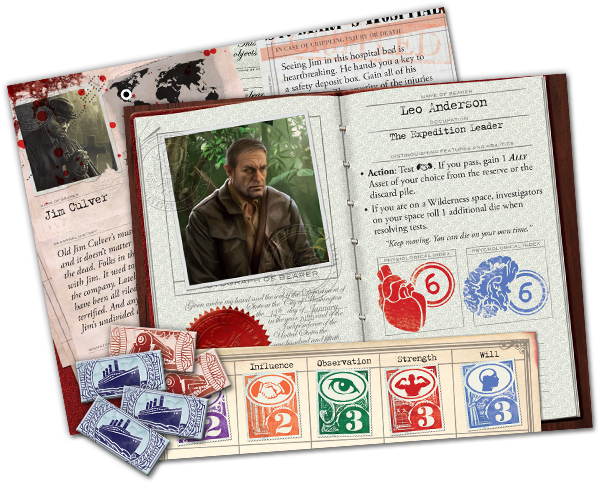 From character sheets that resemble well-worn passports, tokens made to look like train and ocean liner tickets, and a board that displays a yellowed map of the world, Eldritch Horror weaves an engaging tale of a global odyssey to save civilization. Hop a train from Shanghai to Istanbul, hire a witchdoctor in Buenos Aires, or stock up on holy water in Rome… just make your preparations count. You’ll need to work efficiently to defeat the horrors that await you. After all, with each passing day, an elder being of untold power draws closer to devouring our world. 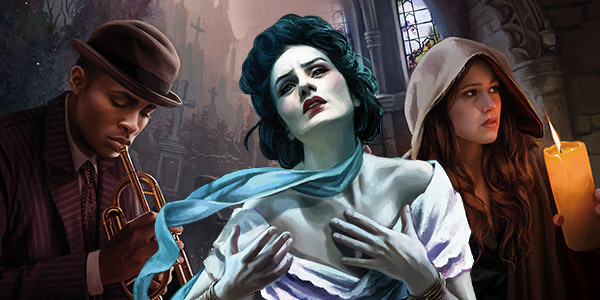 Only by solving three unique mysteries, represented by the tasks on Ancient One-specific Mystery cards, can your team of investigators save humanity and win the game! While the tasks on these Mystery cards (along with the locations of otherworldly gates, menacing monsters, and helpful clues) will often inform both your travel plans and the dangers you confront, you can find adventure anywhere in the world… even where you least expect it. During the Encounter Phase of each turn, players resolve combat or build their investigators’ personal stories by reading an encounter narrative from one of several types of Encounter cards. You might go head to head with a monster in Istanbul, or find yourself in a tough spot with the crime syndicate in a major city. Maybe you will embark on an expedition to the Pyramids, or research a clue you uncover in the unnamed wilderness. You may even find your way through a gate and explore a dimension beyond time and space. Should you fail an encounter, the cost is steep. If you are fortunate, you will merely incur physical or mental trauma. However, you might also be compelled to take a Condition card, which represents a specific injury or restriction gained throughout your journey, such as a Leg Injury or Amnesia. You could find yourself getting in over your head to aquire assets and receive a Debt condition. Or, maybe you’ll owe a favor to something far more insidious than a debt collector, and enter into a Dark Pact! Whatever your condition, you would be wise to find a resolution with haste: many conditions have a “reckoning effect” which, if triggered, ensures a much more sinister fate. 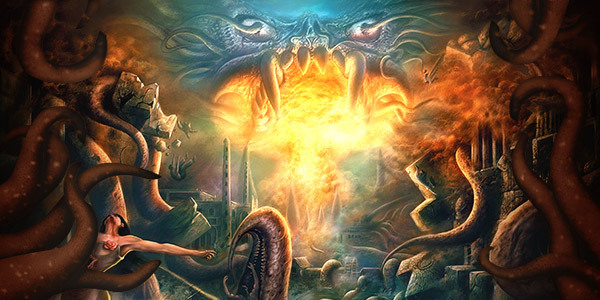 Eldritch Horror includes several features designed to ensure a unique experience each and every time you play. With over three-hundred cards, you can be assured of amazing variety in encounters, Mythos effects, and more. And since each Ancient One has dedicated decks of Mystery and Research cards, you’ll not only select an Ancient One, you’ll select an entire style of play. Further contributing to the game’s replayability, twelve intrepid investigators stand ready to defend the world from a threat that only they truly understand. Take the role of expedition leader Leo Anderson, influential actress Lola Hayes, or any of the included heroes. Since each investigator offers his or her own unique skills, starting assets, and approaches to winning, you’re sure to find a favorite persona for saving the world. Want to customize your experience even further? Newer players may wish to stand against the Great Old Ones with less difficulty, while more experienced players may want an extra challenge. Eldritch Horror accommodates the needs of all types of players with its Mythos cards. With three levels of difficulty, the Mythos cards give you the option of making the game more or less challenging by removing the easier or more difficult cards when you build the Mythos deck. The way will be dangerous and the stakes have never been higher. The Ancient Ones are stirring, casting a shadow across the world. You must fight back. Gather your team, research the clues scattered around the globe, and solve the mysteries surrounding the Great Old Ones. Venture across the high seas or deep into the wild to battle monsters, uncover ancient secrets, and gather dark knowledge as you work to prevent the coming catastrophe. The horror is here. The fate of our world is in your hands. Your journey begins now. Are you ready?